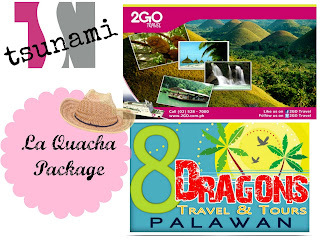 Girl Kuripot Girl Kuripot: @DSoshalNetwork, Win a La Quacha Package to Palawan! @DSoshalNetwork, Win a La Quacha Package to Palawan! This is a chance to win roundtrip 2Go Travel tickets to Palawan and a 2N hotel accommodation and city tour. To join, simply follow The Soshal Network's Rafflecopter. You have until June 27, 2013! Click here to join The Soshal Networks's La Fayette and La Quacha Giveaway.